Description This Buford, Georgia hotel has an outdoor pool, free internet access, non-smoking guest rooms and free breakfast. Complimentary breakfast and free Wi-Fi await our guests at the Holiday Inn Express Hotel & Suites in Buford. 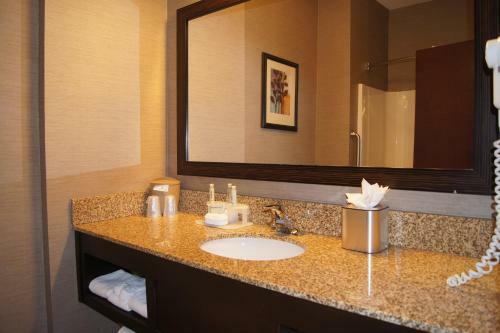 The Holiday Inn Express Hotel & Suites underwent an extensive renovation in September 2011 which included the additions of flat-panel TVs and new furnishings. 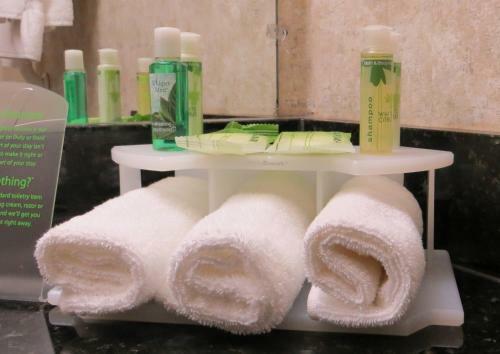 All 79 rooms at the thee-story property also offer coffeemakers cable TV microwaves mini-fridges and free Wi-Fi. Breakfast is on the house and features the hotel's signature cinnamon rolls plus a rotating menu of scrambled eggs cheese omelettes bacon and sausage biscuits and gravy fruit yogurt cereals and more. If work is on your itinerary you'll be happy to know there's a business center fax service and photocopy availability. Leisure-time amenities include a fitness room outdoor pool and indoor hot tub. Parking is available. The Holiday Inn Express is located off U.S. 23 at Satellite Boulevard a quarter-mile from I-985. It's two miles from the Mall of Georgia and three miles from downtown Buford. The Gwinnett Center a popular event arena is 10 miles away. Downtown Atlanta is a 45-minute drive. Hartsfield - Jackson Atlanta International Airport is nearly 50 miles from the hotel. Add Holiday Inn Express Hotel & Suites Buford-mall Of Georgia to your free online travel itinerary.